A great source for paid apps and games, loads to choose from including some tweaks and themes to help you customize your device. Try AppSwitcher for starters. Home to a great choice of themes, including the popular Dreamboard themes, along with games, apps and tweaks, all free. Try AndroidLock and iSHSHit. 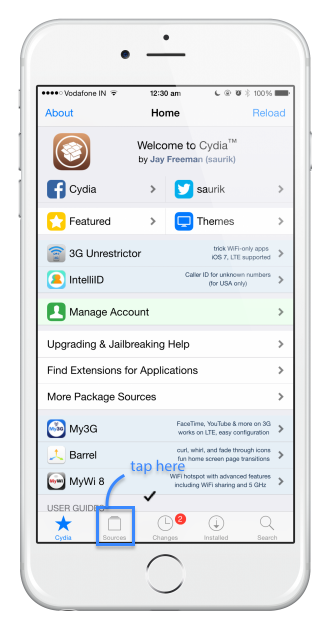 A top source that includes loads of free apps, games, themes, and tweaks. Try BiteSMS and MyWi. While all of these sources, and many others, contain paid content for free, we must tell you that we do not condone piracy and request that you use these sources only to try an app or a game. If you find you like what it has to offer, please consider going straight to the developer and purchasing the app from them, to support the work they do You should also be aware that you are putting your data and device at risk of virus or malware so do ensure you are using anti-virus software on your device. We also cannot guarantee that these repositories have been updated to support the latest firmware or will continue to be updated in the future. Do let us know what you think and follow us on Facebook for more tips.